Just what is going on with falling oil prices, and how will it affect Mexico and expats living in Mexico? Just who is producing oil – and how much? … Who are the players? Just which players are losing money and which ones are making money? Will Canadian businessmen and US businessmen choose to sell oil at a loss? Just what are Russia’s real costs? … Canada’s real costs? … USA’s real costs? Basic Story: US oil production from the new North Dakota & Montana oil shale fields is driving down world oil prices – as the US oil boom has grown to 1.1 million barrels a day – surpassing Iran’s output. Some news sources like the Washington Post are flogging reports of $40 a barrel oil due to “$42 per barrel” US costs – or even “$30 a barrel” Canadian costs – but these WaPo quoted “experts” really don’t fit the realities of actual US production costs. The costs for Russia, Nigeria, Iran, Venezuela, and the Gulf States et al are often described as a cross-product of their production costs per barrel AND their net government spending of oil$$ to pay their government expenditures. Kuwait, Qatar and the United Arab Emirates balanced budget $$ are at about $70 a barrel. These Canadian oil BUSINESS data points are significant, because Canadians produce 4.1 million bbls per day – almost 4X more than the USA or Iran or Libya. Nigeria, Venezuela, and Iran are really screwed by this continuing…. but they can’t afford to stop selling oil – even when selling it at a loss. The US dollar continues to strengthen as oil prices fall – due to Mexican Govt. PEMEX losses of revenues – but since the Mexican Govt. has established its spending amounts based on $79 a bbl of NYMEX crude, we will likely see a weaker MXN peso as long as oil prices stay below $79 a bbl. Coincidentally, $80 a barrel is the typical NYMEX crude price that American and Canadian producers need to make profits, so, smart thrifty expats in Mexico could decide to buy your pesos now – while oil prices are below the $80 a bbl benchmark…. As always: Yucalandia offers information from others as entertainment, and we do not offer legal or investment advice. Talk with a qualified professional when making important decisions. 3 Responses to What’s Going on with Oil Prices? I live atop the Utica and Marcellus formations here in northeast Ohio. The big holdup is a lack of pipelines to take the product to the refinery. Our local gas/oil fields have been in the Clinton formation most of my life, a dry gas formation that was clean enough to use right out of the ground. A great many homes here are heated from a well in the back yard. The oil has been trucked away. The new play is wet gas that has to be refined. It is a horse of a different color. The wet gas has standard gas but also hydrocarbons that in the past were refined out of oil, today it is extra cheese from the gas production and it is much more valuable than the old crude oil. The kicker is that it is just getting started. There are hundreds of wells drilled, few online because of the lack of pipelines, this stuff can not be moved in a truck. In North Dakota they are flaring off the gas to get at the oil, bad practice but common. The real difference in this whole thing is directional drilling. I was an oil field fracker back in 82, fracking is nothing new. The new thing is drilling a hole horizontally through the formation for a mile or so and fracking that bore 50 times. In my day we fracked the bottom of the hole and went home-one frack job per bore hole. The new method costs more per well but they get at a lot more oil. The kicker: old fields that we would consider petered out are going to get re-drilled because the old method left most of the product behind. And we already know what is there because we have the logs and mud sample records. 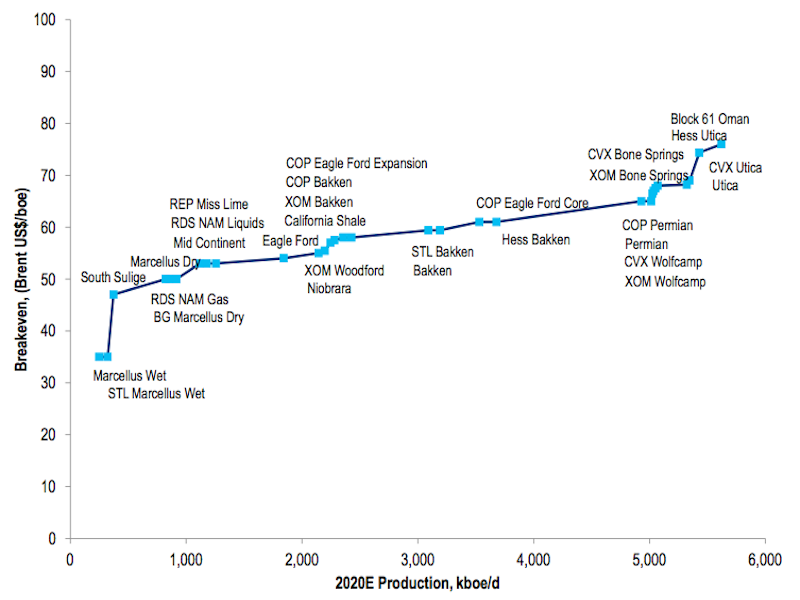 The oil sands might have trouble at 70-80 a barrel. Oil/gas that has to be pushed a long way might have problems at sub one hundred prices but product like what is being developed here in Ohio is cheap once the pipeline right-of-ways and construction is completed. As to the peso, Mexico has a lot of oil/gas on its mainland as well as off shore. The drilling rights on dry land are a problem in Mexico because the landowners get zilch. My Mom&Day pulled a 60 grand check just for the right to look for oil on their 15 acres. The Utica is 600 feet thick under their place. Drilling Mexico’s shale will require a different way of paying the land owner than today’s, ” it’s mine all mine” refrain of the Mexican government. Sixteen pesos to the dollar if the oil price goes to $60.